The New Jersey Department of the Treasury has advertised a Request For Proposal (RFP) (P1155-00) for Design and Construction Services. NOA for Draft Environmental Impact Statement (EIS) for the Rebuild by Design Hudson River Project is published in the Federal Register. NJDEP’s consultant, AECOM, and their sub-consultants, are entering the design phase of this project. Therefore, you may see their field staff in the area conducting subsurface investigations related to the Rebuild by Design, Hudson River Project. Each field crew will have a copy of the letter (see below) from the NJDEP explaining why they are collecting the data in the event any residents or business owners are looking for an explanation as to what the field crews are doing. The United States Department of Housing and Urban Development (HUD) launched the Rebuild by Design (RBD) competition in the summer of 2013 to develop ideas to improve physical, ecological, economic, and social resilience in regions affected by Superstorm Sandy. The competition sought to promote innovation by developing flexible solutions that would increase regional resilience. The proposed project was one of the competition’s six winning concepts; it was developed with the goal of reducing frequent flooding due to storm surge, high tide, and heavy rainfall. HUD awarded $230 million to the State of New Jersey for the Project in the municipalities of Hoboken, Weehawken, and Jersey City. The proposed project takes a multi-faceted approach intended to address flooding from both major storm surges and high tides as well as from heavy rainfall events. 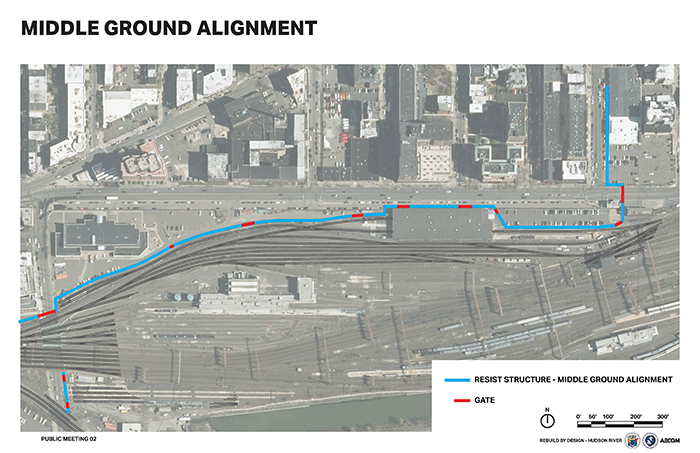 The Proposed Project will occur throughout the City of Hoboken, and will extend into Weehawken and Jersey City, with the following approximate boundaries: the Hudson River to the east; Baldwin Avenue (in Weehawken) to the north; the Palisades to the west; and 18th Street, Washington Boulevard and 14th Street (in Jersey City) to the south. The New Jersey Department of Environmental Protection (NJDEP) as part of the Hudson River Rebuild By Design (RBD) project has sent Cooperating Agency letters to several State and Federal agencies. These Cooperating Agency letters are sent to formalize the agreement between the NJDEP and the individual State or Federal agencies with regards to this project. These letters were sent to comply with regulations implemented by the National Environmental Policy Act (NEPA) which mandate that the NJDEP prepare a NEPA analyses and documentation "in cooperation with Federal and State governments" and other agencies with jurisdiction by law or special expertise (42 USC §§ 4331(a) and 42 USC §§ 4332(2)). All of the following letters were sent to agencies that the NJDEP has been and will continue to work with on the Hudson River RBD throughout the life of the project.